LIVEdigitally is giving away a Slappa iPod Mini Shockshell case each week. In order to win one you must leave a comment on the post labeled “contest post”. This week our contest post is this post! 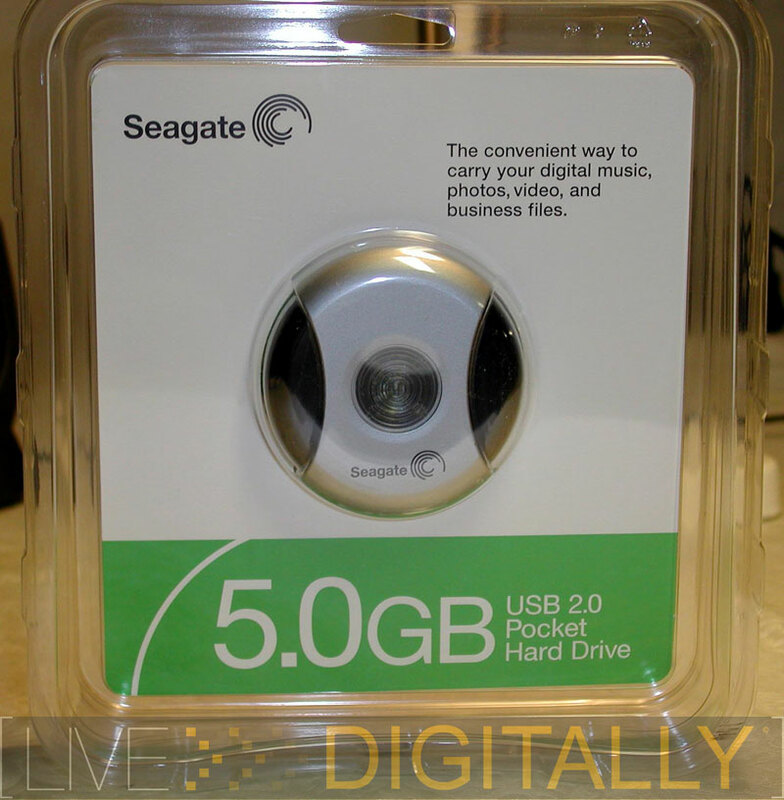 [ Seagate 5 GB Pocket Drive Review by Jonas, Review Editor]. Leave a comment telling us what you’d use the Seagate 5GB drive for and you’re eligible to win a nifty Slappa iPod Mini case! 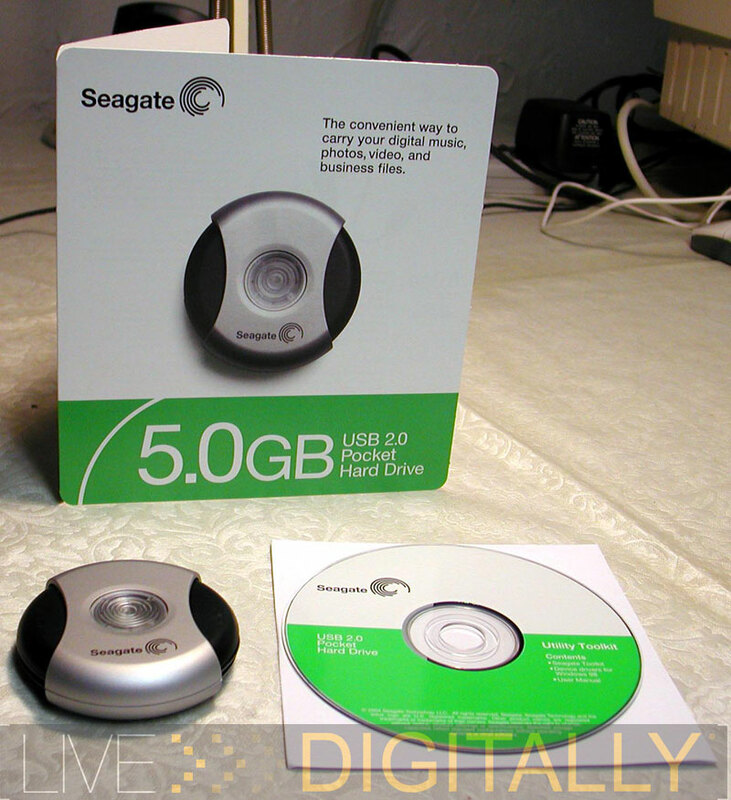 Seagate Technology is a leading manufacturer of hard drives in computers. For their 5 GB Pocket Drive, they decided to cross an external hard drive with those ever-popular USB flash drives, creating a product that addresses an emerging niche. The Seagate Pocket Drive is slightly smaller than a hockey puck and fits quite nicely in a shirt pocket. It is currently available in both 2.5 ($115) and 5 GB ($140) sizes. Similar drives with a 2 GB capacity sell for $200 and up, making the Seagate Pocket Drive a cost-effective option. While there have been portable USB hard drives before, they have been considerably larger. I believe this Seagate drive will be the first of a new product category of portable micro hard drive storage devices. The Seagate Pocket Drive is truly made to fit into a shirt pocket. It has a modern design, with black and silver plastic complemented by a blue LED. The LED acts as the hard drive activity light to indicate when the drive is reading or writing, and therefore when it should or shouldn’t be removed. The black plastic twists underneath the silver and stores a 6” cord; it is very slick to have the cord contained in the device itself. The drive is USB powered through the computer itself, making the Pocket Drive easy to travel with. However, the short cord length limits the device to notebooks, or desktops with front mounted USB ports. Desktops that only have rear-mounted USB ports will need an extension cable or hub to avoid contortion maneuvers like in “Twister.” And all hard drives are inherently susceptible to temperature, magnetic, and shock forces. In other words, don’t drop this drive by an MRI scanner in Death Valley! When in use, the drive is nearly silent; I had to put my ear right next to it to hear anything above the fan of my notebook. The heart of the system is a 1” mini hard drive similar to what is used in the iPod Mini devices. The Pocket Drive spins at 3600 rpm and has 2 MB of cache. Of interest for the geeks, this is half the speed that most hard drives spin at — 7200 rpm. (While this may be fascinating, I would avoid its use as cocktail trivia as it is not a good pickup line — unless at a computer engineering convention.) Formatted, the 5 GB drive has a capacity of 4.64 GB, approximately the storage capacity of a DVD disc. All in all, the Pocket Drive sports a very small product with a polished design that will surely astonish your friends and colleagues. The included software for the Seagate Pocket Drive is quite nicely developed, not as an afterthought like with similar devices. 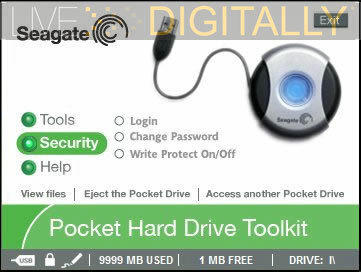 It is called the Seagate Pocket Drive Toolkit, and that is an apt description: It launches whenever the drive gets plugged into the USB port of the computer with the toolkit installed. The Seagate Pocket Drive displays relevant information in a convenient format that benefits newbies and power users alike. 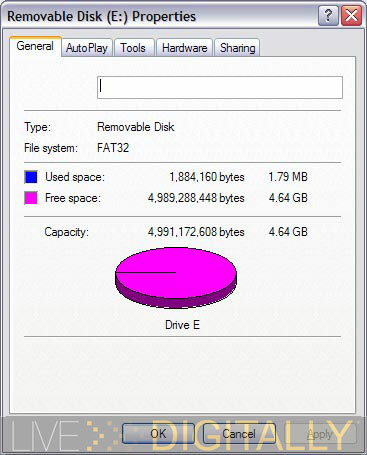 This information includes the used and free space, the drive letter designation, one button to view files, and one button to remove the drive safely. If this is all the software was capable of it would be adequate, but it can do more. Power users will be delighted that the drive can be created into a boot disc, partitioned into another drive, formatted, write protected, or even restored to the factory default. The partitioning is particularly powerful, as the second partition is a password protected secure partition. The partitions can be different sizes. 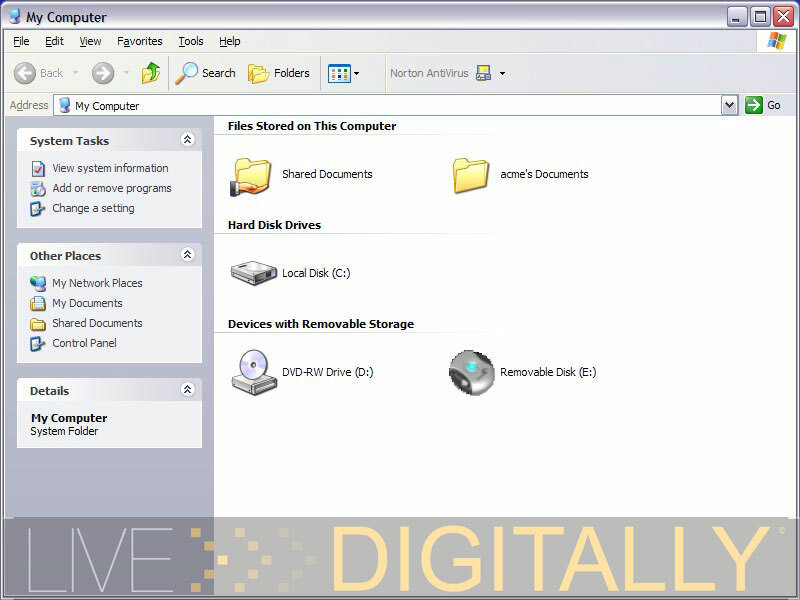 Overall, the tools are a comprehensive addition to the drive’s capabilities. 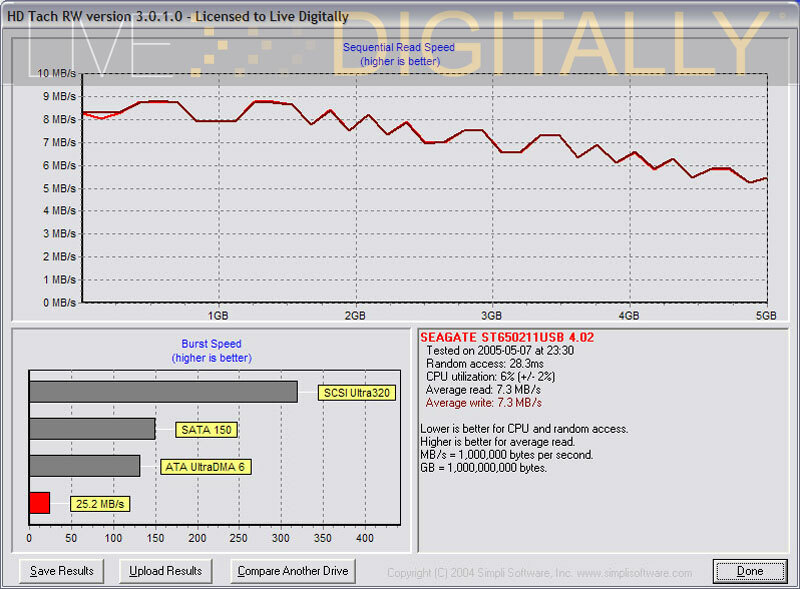 I am introducing to LiveDigitally a new methodology for testing the read and write speeds of various drives: In order to quantitate the drive’s speed, I am using HD Tach 3.0, generously provided by Simpli Software. 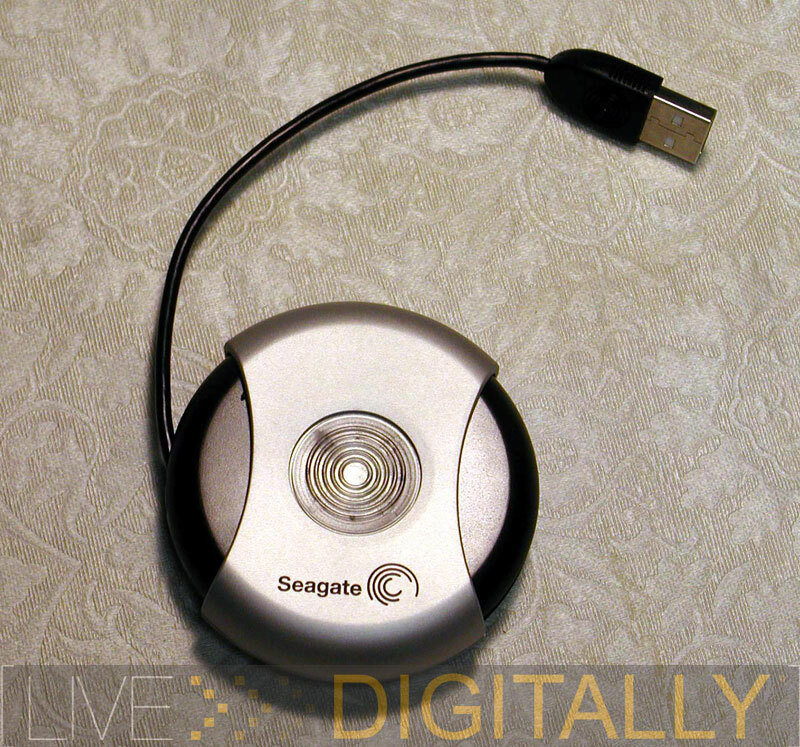 The Seagate Pocket Drive was able to achieve both read and write speeds of 7.3 MB/s. By comparison, my Western Digital 120 GB external drive across a USB 2.0 interface achieves 14.2 MB/s read speed. While Seagate’s Pocket Drive is only about half as fast, it is still at least two times faster than most USB 2.0 flash based drives. (I hope to do some formal testing of these devices in an upcoming article.) Also, the Pocket Drive has a burst speed of 25 MB/s, which is identical to my Western Digital; the drive is plenty quick for small file transfers. In my opinion, allowing for the small form factor, these transfer rates are more than acceptable. While it may not be the ideal drive for video editing, it is great for lugging around a large chunk of files in a very convenient format. I am very pleased with the Seagate Pocket Drive, and award it the coveted “LD Approved” honor. For users willing to trade the convenience of a flash drive on their key chain for a Pocket Drive in their shirt pocket, they will be rewarded with a much larger capacity, and faster read and write times, than flash memory can currently offer. Who should keep a spot in their pocket or bag for this? When on the road, the Seagate Pocket Drive is far more efficient and convenient for incremental backups on the road. It holds 7 CDs worth of data and can be accessed far more simply without worrying about splitting files or complicated backup procedures. If you’re the loaded digital donkey transferring large amounts of data between home, work, and school this is for you. The Pocket Drive is ideal for moving pictures, music files, Photoshop projects, smaller video projects, and presentations between various computers. This makes it great to tote pictures or a presentation across the country, letting you leave the notebook at home. If you’re constantly on the move and working on a project across multiple computers (most of which are not yours), this drive is easy to work on and lets you keep your data in one place. Not having to install drivers makes The Seagate Pocket Drive ideal for this sort of activity. Digital packrats will take quite some time to fill up its large capacity compared to USB flash drives. 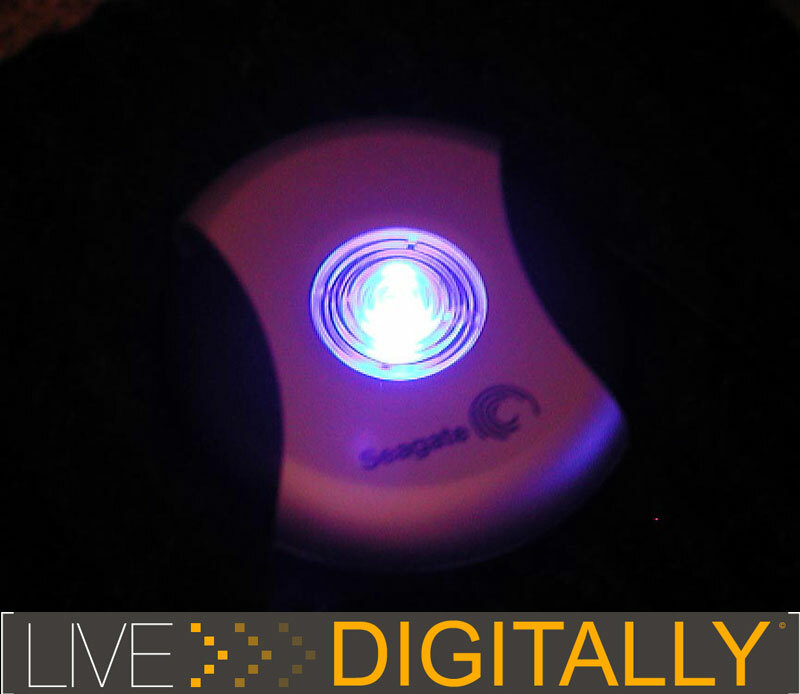 Special thanks to Seagate Technology for supporting this product review. YES! blue LED activity light! I have a half gig USB flash drive that I’ve been using for synching files between home and work. I’m no math expert, but it seems like this would hold up to 10 times more. That could be handy. not bad for a little round saucer! These comments are hardly overwhelming. This is a great “BREAK THROUGH” for the portable HD industry. As folks have more data, and applications to take with them, this device is essential for the power user on the go. Contest Post……This thing looks awsome…..I definantly need something like this as a computer tech This would be great to move drivers and carry a list of apps on. A little more cord and ya got a great garat . Why not wait til its smaller and holds 100 GB? Maybe next year. The only reason I haven’t bought a USB HD before is the price – I’ve stuck with flash. The price is good, specs are right, looks cool too! Does it work with OS X?? Is the contest still active? I have World of Warcraft installed on mine so I can play anywhere there’s a decent PC with an Internet connection. yes, I believe it works with Mac. There were Apple drivers included on the CD. so what functionality does the software add. i also saw this on aots i think, they said its pretty great. also i would use it to transfer and save files from college. I often install integration server software from images larger than my 1 gig flash drive will hold. This would come in handy for those tasks. Awesome device. I wish I had it last month before i lost 3 years worth of data. Sweet! I’d like one and will order one! This is exactly what I am looking for. I will be buying one. As a graduate student working on a disertation on multiple computers, this is the ideal solution to my file transferring needs. I like the donut shape w/ disco light when moving pron! Its size is awesome,but it lack speed compared to the latest pen drives(Lexar’s Lightning Drive).I think it suits for those who want to have a small backup,not for quick sharing of data.Since the price is less i can have one.